Curated by Carly: Julep review + promotion + giveaway! 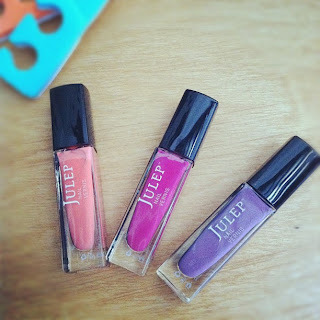 Julep review + promotion + giveaway! Last week, Julep approached me and asked if I wanted to be apart of their VIP Blogger program. As a nail polish addict, I couldn't say no and was sent my first Maven Box to review. I was able to choose which style I wanted, and as I looked through the Maven style profiles, I loved the bright colors of the "It Girl" Maven Boxes. On the day I received my black Julep box in the mail, gave myself a mani/pedi and was thrilled with the results. In my first "It Girl" Maven Box, I received Julep's Sasha, Lily, and Charlotte. I absolutely love the colors Julep sent me - it was hard to decide which color I wanted to paint my nails first! I decided to go with Sasha. I couldn't resist this bright and feminine coral-peach color. It looks great with my skin tone and is a bright & sunny color for summer! You can't beat the quality of Julep's nail polish. The color goes and smoothly, thicker than other polishes I've used, and looks like I manicure from the salon. Julep's polishes last days after application - this polish has stayed beautiful longer than any other nail polish I've used. With no yucky stuff and an endless rainbow of colors, Julep nail polish is the best polish I've every used and I HIGHLY recommend it to all my readers! Start here by simply taking the Maven quiz to see what your Maven style is, select your Maven subscription, use the promotion code above, and VOILA! 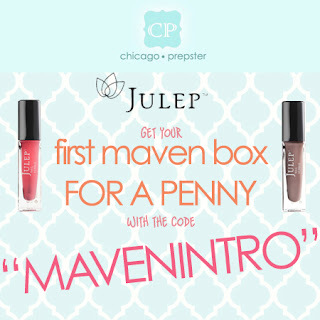 Your Maven Box will arrive in approximately one week and all it cost you was a penny! One lucky Chicago Prepster fan will win a FREE Julep Maven Intro Box worth over $40! You have until TONIGHT AT MIDNIGHT TO ENTER THIS GIVEAWAY below (despite what Rafflecopter says)! Awesome giveaway! 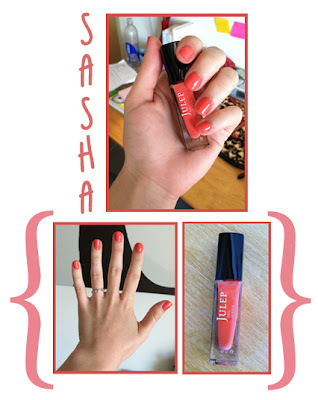 I've been wanting to try Julep nailpolish!